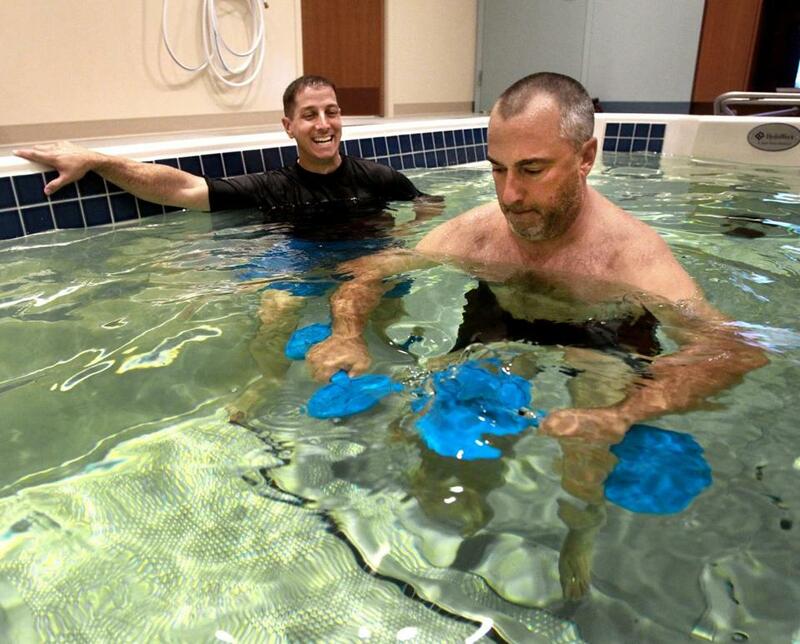 Ryan Stoddard (left) works with Ed Fleming during an aquatherapy session at Emerson Hospital&apos;s Center for Rehabilitative and Sports Therapies in Concord. Most of the workday, Ryan Stoddard wears the uniform of a physical therapist: a polo shirt and khaki pants. But sometimes he trades those in for his bathing suit. Stoddard, chief physical therapist at Emerson Hospital’s rehabilitation center in Concord, spends several hours a week guiding patients inside the hospital’s new therapy pool. Aquatic therapy can benefit people with various shoulder, leg, and spine problems. When moving on land is painful and difficult for patients fresh off an injury, the water is much more forgiving. The laws of physics mean that if a patient is waist-deep in the pool, her body feels 60 percent lighter. When a patient is chest-deep, the body feels 80 percent lighter. The water is no more than 4½ feet deep, so even patients who don’t swim can use the pool. Stoddard watches their progress through underwater cameras that display movements on an overhead screen. The pool is equipped with an underwater treadmill, on which patients practice walking. Stoddard turns up the jets to create more resistance. For patients trying to regain movement in their arms, he provides other tools, including dumbbells. Many patients start with a few pool sessions before moving to “land” — also known as the gym. Insurance companies typically cover four to eight sessions for patients who require aquatic therapy, Stoddard said, but some patients enjoy it enough to continue sessions at their own expense. Know about an interesting workplace? Tell us about it at yourstoryhere@globe.com.